Gold Toe Support Socks. Gold Toe the Standard of Quality® in comfort, fit, and durability. Gold Toe Support Hose are engineered to relieve discomfort associated with varicose veins and swollen legs. 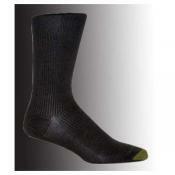 The contoured shape improves circulation by decreasing pressure from ankle to knee. Almost three times the wear of conventional socks. Constructed from 80% Nylon, and 20% Lycra Spandex.